Use disk quotas to manage storage growth in distributed environments. Disk quotas allow you to allocate available disk space to users based on the files and folders that they own. Windows 2003 disk quotas track and control disk space usage on a per-user, per-partition basis. 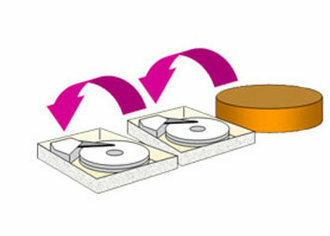 Disk usage is based on file and folder ownership. 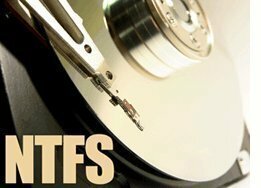 When a user copies or saves a new file to an NTFS partition or takes ownership of a file on an NTFS partition, windows 2003 changes the disk space for the file against the user&apos;s quota limit. Disk quotas don&apos;t use disk compression. Users are changed for each uncompressed byte, regardless of how much hard disk space is actually needed. Free space for applications is based on the Quota limit. 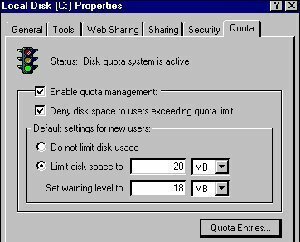 When you enable disk quotas, the free space that windows 2003 reports to applications for the partitions is the amount of space remaining within the users quota limit. Windows 2003 track disk quota independently for each NTFS partition, even if the partitions reside on the same physical hard disk. In the limit disk space set warning level to boxes, enter the values for the limit and warning level that you want to set. Select the deny disk space to users exceeding quota limit check box. In the properties dialog box for a disk on the quota tab click the Quota Entries button. In the Quota Entries for dialog box create an entry by clicking New quota entry on the quota menu and then selecting a user. Configure the Disk space limit and the warning level for the individual user. In my pc there is two user account Administrator and Limited. The Limited account does not open the e: The file system is NTFS and there is Quota. how can i solve it??? Login as Administrator, right click on the E: disk and go to properties, then the Quota tab, and uncheck “Enable quota management”. That’s gotta do it. 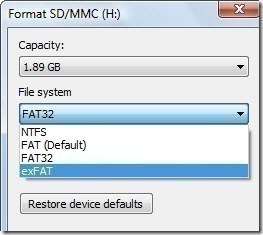 What is a GPT Protective Partition? 142 queries in 0.279 seconds.